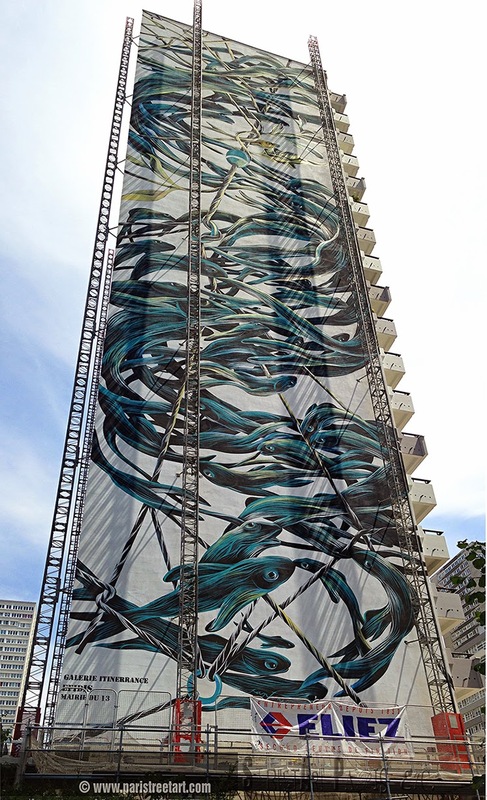 In June this year, Pantonio (Antonio Correia), Portuguese artist, created the highest, as far, mural in Europe. Pantonio has always been the part of artistic exhibitions, urban art festivals and even called once to go to China to design a giant mural, consisted of animals culturally relevant to China (more details and photos here). This largest mural in Europe, was unveiled in 13th district in Paris, on Thursday 19 June 2014. On the website of Galerie Itinerrance, which is the official patronage of this urban series of paintings, we can find few informations about it. Namely, Pantonio was working on this fresco one month long and it has (the wall of the building actually) 66 meters high and 15 meters wide. There's a documentary book by Jerome Thomas "Sky is the Limit, the painters of the extreme", where we can find this and much more other photos about "making-of". Just next to it, on another building, there's a huge mural done under the patronage of Galery Itinerrance as well, ordered by the Town Hall of the 13th district of Paris. What will be the next mighty animal to inhabit on of the walls in this district?